Bright Plastics manufactures heavy duty receptacle lids and other components for the waste management industry. 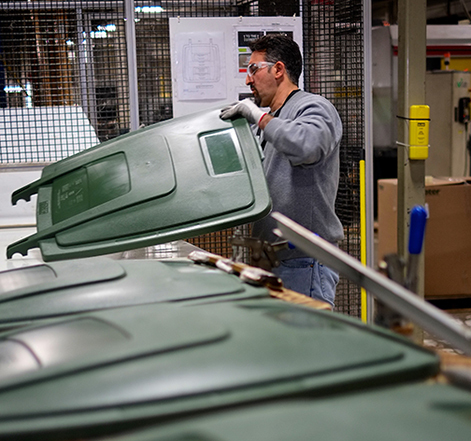 Bright Plastics developed the process for molding the first plastic injection molded waste receptacle lid for a national waste management company. Since that time, we’ve honed our skills—and helped extend both our customer’s product line and our own capabilities—by manufacturing multiple lids in varying sizes and colors. Our variety of in-line and off-line decorating processes provide product labeling options. In addition to 32-, 48-, 64- and 96-gallon heavy duty receptacle lids, Bright Plastics manufactures many waste receptacle components. We'd like to talk with you about your project and offer our recommendations for a smooth, competitively priced manufacturing solution. Please call 336-668-3636 or email sales@brightplastics.com.